CBA12 took place in Lilongwe, Malawi from 11-14 June 2018. Adaptation practitioners, researchers, policymakers and investors met to discuss how to promote local action on climate change. 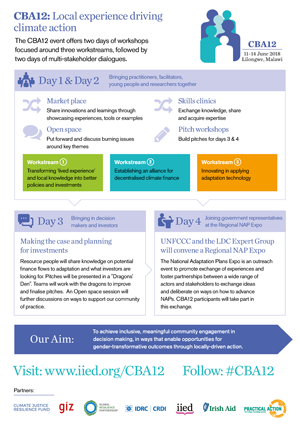 This page contains the key messages from the three workstreams developed from three days of collaborative work, plus summaries of the daily activities at the event. We looked at five different approaches to delivering devolved climate finance (DCF), agreeing that any strong approach would need to be inclusive, be able to build climate resilience and would have scope for scaling up. We then explored whether these approaches were investment ready, and whether they could be merged to make them stronger. Structures behind DCF are key: government institutions must be strengthened so mechanisms are in place to get the funding to flow in a way that is transparent and accountable. It’s also important to invest in structures that empower communities – so local people have a leading voice in how climate finance is allocated. We recognised that the role of national government may differ from country to country. Strong DCF approaches are backed by good evidence, data and quality assurance – these elements are crucial for unlocking climate finance from sources beyond the usual donors. And they need to be flexible to respond to the different priorities of different groups within communities. Bottom-up accountability mechanisms hold the system in place and support quality assurance and decisions that ensure sustainability; there are lots of good practices from the ground where communities are monitoring investments, ensuring they meet the needs of local people. Community-led decision making is essential to ensure adaptation projects really benefit communities on the ground. This workstream examined how technologies help local communities adapt to climate change and how these technologies can attract investment. New technology has been an enabler of climate change mitigation – but this is yet to happen for adaptation. To get the finance and innovation needed requires more committed support and investment. And we need to mobilise the private sector to secure the innovations and resources needed to achieve adaptation at scale. We need affordable, co-created and long-term adaptation solutions that work within local and commercial market systems. For effective agricultural adaptation, for example, we recognise that system change will only take place if we recognise that most of the actors – including smallholder farmers – are private sector actors connected to and influenced by markets. For agricultural adaptation in developing countries, technologies need to use or build on assets that the rural population and smallholder farmers already have – to ensure these technologies are accessible (low cost). They also need to be reliable, maintain or build the natural capital on which they depend, and be productive and profitable in the long term. Adaptation technologies can be divided into three broad categories: those building ‘infrastructural assets’ (dams, reservoirs, areas of gravity, solar powered irrigation); some building ‘physical assets’ (portable solar pumps, crop varieties or animal breeds that perform or cope better with the changing environment, or improved cook stoves that help reduce demand for charcoal or fuel wood). In many cases the ‘asset’ being created by the adaptation technology is improved decision-making, strengthening land, water, or forest management. Effective adaptation approaches often require investment in multiple technologies and types of asset. For example, both improved cook stoves and land management decisions and practices can contribute to improving fuel efficiency and addressing deforestation. Achieving gender-responsive and inclusive adaptation – addressing the needs of women, youth, or less powerful or less well-resourced people – requires an understanding of the characteristics of a ‘technology’. A stronger understanding would consider the accessibility, ownership and the ability to modify, reuse or experiment with the technology, its long-term environmental impacts (such not inadvertently leading to mal-adaptation), and, importantly, its scalability. Sustained and effective adaptation requires a holistic approach, hence the past and present emphasis on integrated watershed resource management (IWRM) and ecosystems-based adaptation (EBA). This is not disputed; however, to use ‘technology’ to lever greater investment and support, we need to focus on the properties of the technology, strategies for its uptake, and making the various returns on investment explicit. We examined how to prepare robust narratives that take experience from evidence to influence. How can we take 'lived experience' from evidence and use it to influence climate policy and planning? We know evidence is critical for those making decisions around adaptation funding – practitioners at CBA and beyond need to provide robust, reliable and transparent syntheses that can guide investment decisions. Findings from monitoring and evaluation should be brought together to establish what is best adaptation practices in a particular context. We agreed that learning is fundamental for building, sharing and improving evidence. This requires incentives for learning from experience and platforms for sharing, a clear learning agenda, a safe space for reflection, and the right tools for aggregating and analysing information. We also examined how gender inequalities are entrenched in evidence gathering processes – influencing what evidence is sought, what evidence is considered ‘valid’, and who should provide the evidence. This constrains the value of the evidence. Achieving gender responsive adaptation needs more attention and greater emphasis than it is currently getting – participants agreed that climate adaptation can be an entry point to address gender inequalities. We need to close the climate technology gender gap by developing and ensuring access to technologies that are gender sensitive. In this audio clip, Saleemul Huq, IIED senior fellow, Climate Change rounds up activities from the first three days of CBA12 and explains proceedings for the NAP Expo which occurred on day four. Huq then sets out how key messages from this community-based event will feed into global climate policy dialogues and processes to ensure voices from the grassroots are heard. If your browser doesn't support HTML5 audio, here is a link to the audio instead. In the video playlist below, CBA12 participants reflect on key sessions from over the four days. This is also available on IIED's YouTube channel. On day four, CBA12 participants joined government representatives at the Regional National Adaptation Plan (NAP) Expo. The NAP Expo is an outreach event organised by the Least Developed Countries Expert Group (LEG) under the UNFCCC. Paul Desanker, manager of the Adaptation Programme at the United Nations Framework Convention on Climate Change (UNFCCC), set out the aims of the day. The event brought adaptation teams from national governments together with the CBA community of practice – including civil society, researchers and youth – to discuss how national climate plans are advancing. Participating countries are at different stages in their planning, with each encountering different challenges such as how to scale up adaptation, access finance and how to ensure adaptation is gender sensitive. The NAP creates a space for these groups to exchange knowledge and good practice and to share ideas on how to identify and plug gaps in their national climate action plans. IIED researchers will be presenting a range of work in Cape Town – read more about IIED's participation at Adaptation Futures 2018. Day three opened with a Gender and Climate Talanoa. A talanoa is an inclusive, participatory conversation – and this talanoa included climate negotiators, policymakers, private sector representatives, practitioners and women at the grassroots. The talanoa was opened by Mary Robinson, the first woman President of Ireland and former UN High Commissioner for Human Rights. Robinson highlighted the importance of valuing 'lived experience' in climate discussions. Another panellist, Stella Gama, deputy director of forestry at Malawi’s Ministry of Natural Resources, Energy and Environment, told the gathering that local and traditional knowledge voices are central to climate action. The talanoa discussions focused on how to help grassroots and indigenous women participate in local, national and international decision making on climate action. At the CBA12 ‘marketplace’, Zerihun Dejene Fitteheawek, environmental officer at PHE Ethiopia Consortium, explains how high population growth adds to the strain for countries that are already experiencing the impacts of climate change – erratic rainfall, food insecurity and extreme weather events. Families that are smaller in size can adapt more easily. The importance of attracting the private sector – this is a big challenge, especially for those working on adaptation in the hard-to-reach vulnerable areas where we need to attract a lot of investment to tackle the challenges of climate change. According to Orindi, we need to look in more detail at how to attract the different private players, from the small to the medium scale. And maybe if the environment is good enough we can then think about how we can tap into the bigger private sector players? Participants had the opportunity to participate in numerous skill share sessions. Topics ranged from community-driven advocacy, to better blogging, to multiple use water systems and farmer field and business schools. The opening day of CBA12 featured a ‘CBA marketplace’, in which participants visited exhibition stands for ten-minute discussions about projects, case studies and tools. Participants had the opportunity to present good-practice narratives based on their own experiences and discuss them with colleagues. One marketplace presenter was Vidhya Sriram, senior technical advisor for research at NGO Care International. She introduced a joint project with the International Fund for Agricultural Development (IFAD) that designs smallholder agriculture adaptation programmes that listen to the needs of women and girls. As Sriram explains in the video below, this work is about building skills so that smallholder women farmers can implement climate adaptive practice, it’s about understanding the social norms that govern decisions made in the household. And it’s about structural change: making sure women’s voices are heard in decision making forums. Thinking about the differential needs of women and girls from the start, taking into consideration how they experience climate change differently and getting women access to key decision making spaces are all crucial steps towards truly gender transformative climate action. See Sriram describing the project in the film below, or watch the video on IIED's YouTube channel. 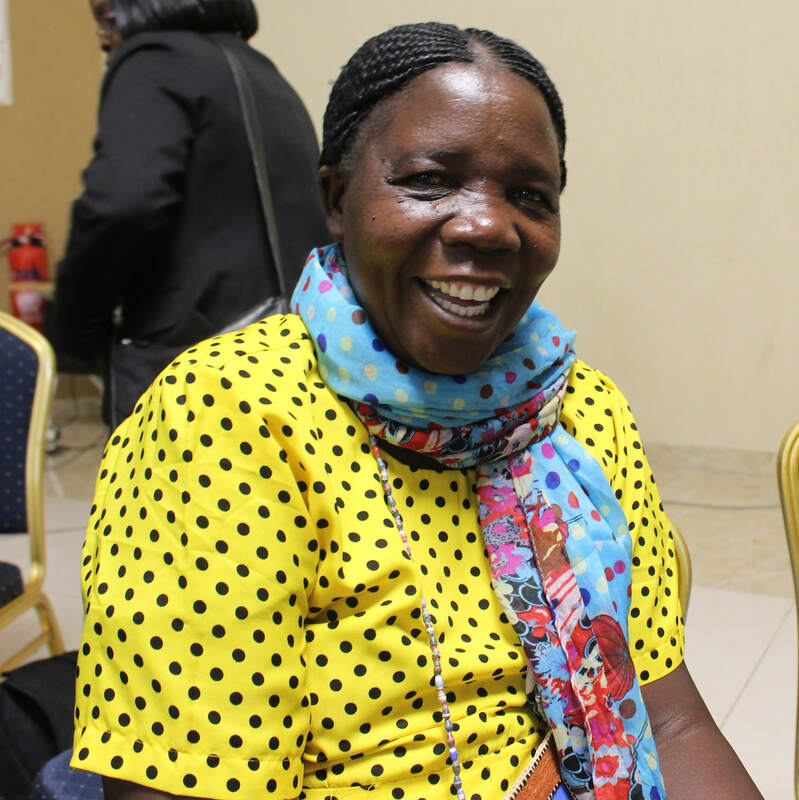 “I heard on the radio that there was going to be a meeting in town about food research; I went with my team from Osukuru United Women’s network – we went along and answered all their questions. We described how the weather had affected the community – the floods and the droughts, and the hunger and disease it had caused. And particularly how women and children had been affected, it is they who suffer the most. The CBA12 programme included two days of workshops, followed by two days of dialogues. On days three and four, policymakers and investors joined participants to discuss how to propose and plan locally-driven climate investments; the enabling environment needed for scaling-out and up; and ways to further strengthen our community of practice. The CBA12 event was organised by IIED in partnership with the Climate Justice Resilience Fund, GIZ, the Global Resilience Partnership, the International Development Research Centre, Irish Aid and Practical Action.